Last week on my POST Magazine blog, I briefly discussed Encoding in Post: The Four Hot Spots. I figured, “Why not elaborate on one of those areas?” Thus far, I’ve discussed the concept of Pre-encoding, and various facets of the final encode. Let’s talk about the most vital and often overlooked area: During Editorial. Of course I’m (initially) referring to the almighty DVD, which all of you assistant editors need to burn daily – all, naturally, with different watermarks and circle takes or various cuts. Plus, that Blu-Ray for that Director with the fancy car – you know who you are. However, more and more above your paygrade individuals who foot the bill for your paycheck are using non-traditional devices to view media. The web has undoubtedly become the new standard, with petaflops of media files being FTP’d daily. Flash, Windows Media, and heavily Compressed Quicktimes are all popular options – and many times, are all needed. New fangled video enabled mobile devices – like the iPhone, Blackberry, and Droid – have increasing become the way to view video while on the road between business meetings and Starbucks pit stops. Those facilities that have been wise to adopt Digital Asset Management (DAM) internally will also need a version for tracking, as well. So, yes, dear assistant editor, you now have several DVDs, web versions, and mobile versions to create. Plus, there is always – always – that oddball version you need to create. It’s inevitable. All in time for the next edit session tomorrow. This is when you need encoding. And a hellova lot of it. I can only hope that all of you, dear readers, are familiar with the concept of a Quicktime (QT) Reference. No? Then Unca Michael will enlighten. A QT Reference is simply a pointer file. It’s a small media file that appears as a full movie file to most media players, but during playback, it points back to the initial media used in the generation of said QT reference file. Think of it like that bookmark in your web browser. That bookmark isn’t the entire website, but it pulls up the website when you click on it. It’s a link. QT references are your best friend. Why? 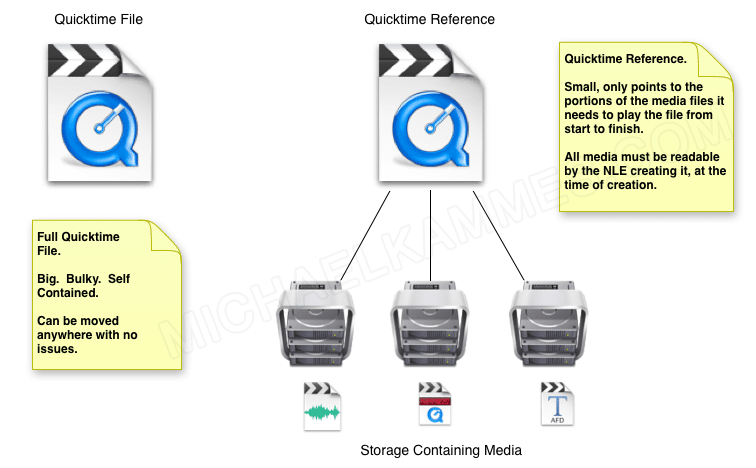 Most NLE’s can generate a QT Reference much faster than exporting a whole “complete” file. Thus, less time watching a progress bar. (Although, ironically, having the wait time does give you time to get coffee to stay awake and watch the progress bar longer. Interesting.) This speed boost is accomplished by having the NLE only create new (render) files for media that has some sort of effect on it in the timeline. All other media is untouched, and thus, the QT Reference can point to it. Brilliant! So, I’ve already saved you oddles of time. Waiting. Now, I need to earn that bonus, and you need to take this QT reference goodness and utilize the strength of it’s pointers to create the compressed files needed for your deliverables. At this point, it may be a good time to check out this post, as I explore choosing the right encoding solution. In a nutshell, you need an encoding solution that can accommodate all of the formats you need to deliver. It’s mighty beneficial to have a solution that can encode into multiple formats at once. Again, less thumb twiddling time. Here is where I drop the “But…” bomb. I must tell you something vital when dealing with QT references: Your encoding solution MUST sit on the same network as your edit system and media storage. Huh? The QT reference is aware of where the original media is in relation to itself when it is created. 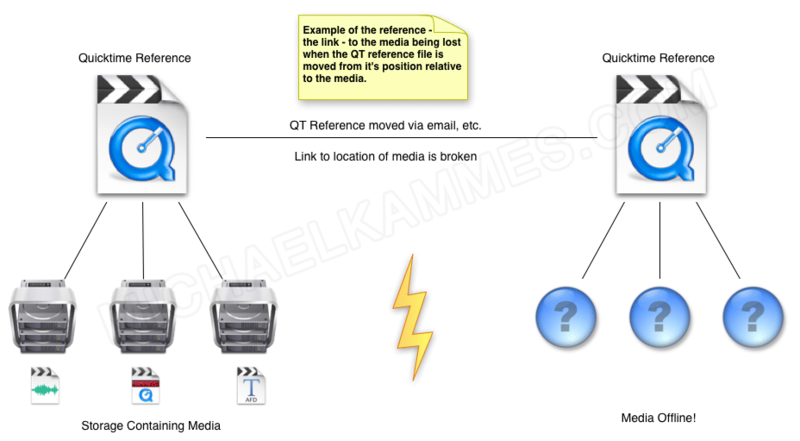 If a user were to say, I don’t know, email the file, or even move the QT reference to another folder (even on the same system), the link to the original media is lost. Yeah, big gotcha. That’s why I recommend having your encoding weapon of choice on the same SAN/NAS as your edit bay…or have a firewire drive on standby to copy the QT reference and media (retaining the same hierarchy) to move from the edit bay to the encoding solution. Solutions like Root6’s Content Agent (see my review here) are actually built explicitly for this purpose: not only can Content Agent sit on any Windows compliant SAN, but the system can handle concurrent encodes, auto FTP files, email status updates, and automate DVD burning with watermarks. And while I’m sure burning and labeling those DVDs fulfills your life’s purpose, there is even a more efficient way to streamline that. Look into Rimage: Automated network DVD authoring and label printing, scalable from small runs to large runs. While I am sure this will not keep you from many late nights in the edit bay, it very well may give you a few more hours to crash on that old couch in the back of the room.